First, let me say I am not advocating for every woman to fast while she’s nursing. Some are able to while others are not. This is not medical advice, but rather my personal experience. I did not think I would be able to fast this year, but alhamdulilah, I’ve been fasting each day and the milk supply is still going strong, which is a totally different than when Little Miss was under a year and I was trying to fast. Who would have thought? I think part of the success in fasting while nursing is just a difference in my milk supply from one kid to the next, but I think part of it also is from just being smarter about how I fuel my body. Here’s what I’ve done a little different. Yes, I know it isn’t recommended, but I do think that if I didn’t stay up at night to get some extra glasses of water in, I would have a harder time keeping up my milk supply and then not be able to fast each day. Tulip is only 3 months old, so there’s no other source of nutrition for her other than what I provide. I try to snack during the night, but that has been less and less each day as I’m just not that hungry. Staying up through the night also helps me get in some quiet time. I can listen to lectures, do some reading (though this is better after sleeping for a while so I don’t end up falling asleep! ), working out, knitting/crocheting, and cleaning up my to-do list. I’m on a mission to wrap up a lot of loose ends this summer, in sha Allah, and this quiet time has really helped me do just that. I seriously can’t believe what a difference the fenugreek makes! A friend of mine told me that you have to get it in pill form, otherwise it isn’t strong enough, and boy she was right! I had the liquid form a couple years ago and I just couldn’t keep my supply up enough to continue fasting. Sure, you smell a little like maple syrup, but that’s not too bad! You can even find the pills in veggie-based capsules instead of gelatin capsules, and through Amazon no less! Score! I think Little Miss is starting to go a little crazy with the late bed time, and therefore she is starting to drive me a little crazy. She is playing in anything and everything that she shouldn’t be, and nothing she should be. We all need a nap, very badly. Plus, staying up all night leaves me with less sleep than if I were to sleep after isha, so for everyone’s sanity, I must take a midday nap. And hey, it’s sunnah, right? My favorite sunnah ever. While I can, I am trying to always keep a glass of water next to me that I’m sipping on. Getting in 64 oz of water in 7 hours time isn’t hard, but it does take a little work to remember to keep drinking it even if you’re not thirsty. I’m sure I’m getting in more than 64 oz, but given that I’m nursing, it can’t hurt. Plus, spreading it out over the night helps me get to sleep after fajr easier. Ohhh, two years ago when I was trying to fast and Little Miss was still under a year old nursing, I tried to down three somewhat large glasses of water all an hour before fajr. That was not fun. Our house has one bathroom. That was an issue, for sure. Plus, it felt like my bladder could explode after around 10 minutes. Not a smart idea. Taking the kids outside and to activities really helps the day go on more smoothly. Before I had little kids, I secluded myself and worked on learning and worship. Now, if I try to stay inside and work on things, Little Miss starts bouncing off the walls. We must leave the home every day or she starts to lose it. LOL! 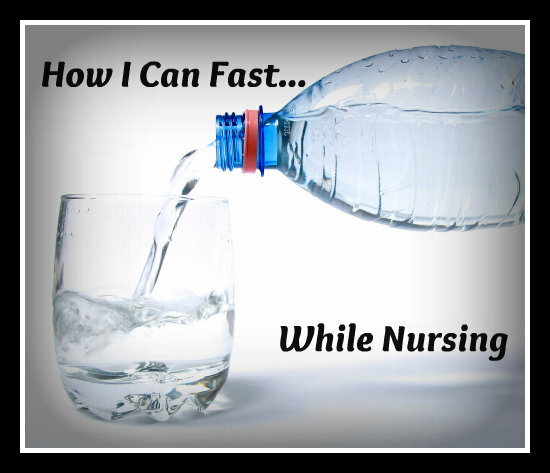 Have you been able to successfully fast while nursing? What helped? Nice advice. I have never heard of using fuengreek tho. I get asked this a lot now that I have 9 kids MashAllah and I always tell them to keep drinking water when you can. My last one, I had him just one month before Ramadan and had no problems fasting that month Alhamdulillah. Wow, mashaAllah, that’s impressive! Have you noticed your supply increasing with more kids? Tulip (my 3rd) is by far the easiest in terms of having a good milk supply. It was a bit of a struggle with my other two. Really enjoyed this piece. My little one is older than yours but he still needs his feeds. This is the fourth year I am breastfeeding and fasting (2 years with baby 1 and this is 2nd year with baby 2). I know you can make them up if you don’t fast, but it is just as tough making them up. I struggled to make up fasts I missed while pregnant. Like you I stay up all night (and it’s a short night!) to make sure I’m getting enough water. It’s nice to have that quiet time. May Allah make things easy for us all. I have been loving the quiet time as well! Unfortunately, I’ve had to take a break from fasting because my milk supply has dropped. I thought after 5 days, I would have seen it so I was going to be fine. Allah knows best, alhamdulilah. I can totally relate to this. It’s much harder making up lots of missed fasts outside of Ramadan, so I am fasting and breastfeeding too. Alhumdulilah it is a short night, so I spend most of it trying to get as much fluid into me as I can. May Allah make things easy for us all.